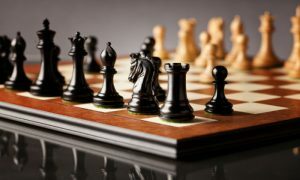 We gathered the most beautiful and prestigious antique chess tables in one list to help you find the perfect furniture. 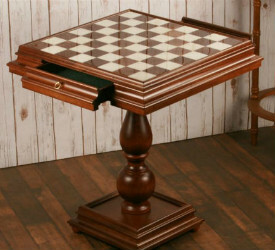 An antique chess table can add a level of distinction to your home or office that is hard to find in a newer product. Even if the table is new, but crafted in a vintage style, it can add a lot to the ambiance of the room. But, as the saying goes, they just don’t make them like they used to. You can often find a better quality, more sturdy product when you buy an antique chess table than you can when you’re shopping for something more modern. 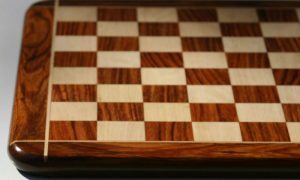 A vintage chess table that has been passed down through a few generations before it gets to you is more likely to hold up for several generations more than one manufactured in 2019, believe it or not. The appeal of antique chess tables is also hard to deny. 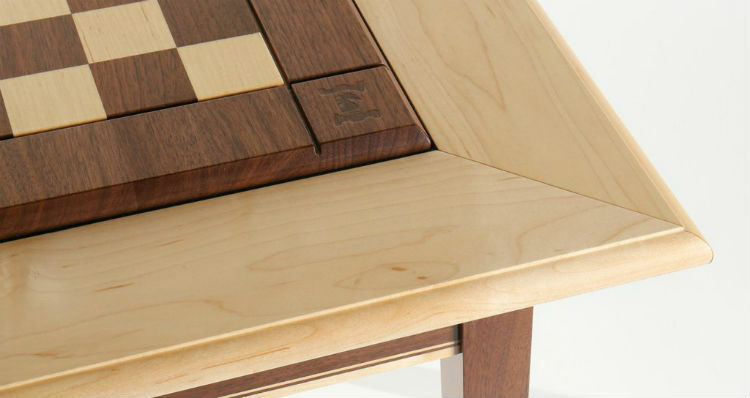 The rich wood and handcrafted feel of vintage chess tables make each one a unique work of art. It’s a special thing to have a one of a kind piece crafted with such careful attention to detail in your home. There’s a beauty about antique chess tables that no other style can even hope to match. Of course, beauty is in the eye of the beholder, and everyone has their own personal preferred style, but there is no denying that antique chess tables are gorgeous! If you’re ready to add an antique chess table to the decor in your home but you just don’t know where to look, you’ve come to the right place. 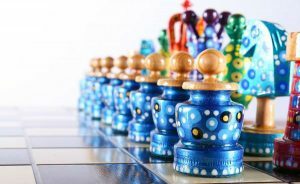 We’ve compiled a list of the best antique and vintage chess tables on the market in 2019 so that you don’t have to look high and low to find a good table! The Genuine Italy Alabaster Chess Table is a masterpiece of antique chess table design. The four individually spun legs, along with its scalloped corners give it an undeniable antique flair. Its solid walnut construction will hold up to years and years of use, possibly even generations if it’s cared for properly. The game board is made from individually cut 3.125 inch squares of white and marbled brown alabaster that have been carefully inlaid into the wooden table surface. All together, the playing surface is 25 inches square, and it accommodates pieces with bases that are up to 2 ¾ inches across or less. The high gloss, shiny surface of this vintage alabaster chess table looks good on its own or covered with a classic set of chess pieces. 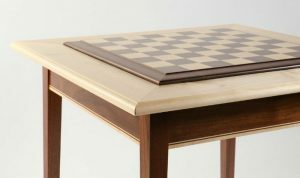 The Genuine Italy Alabaster Chess Table also features two large drawers on either side of the table that can easily accommodate sets of chess pieces, chess clocks, and other accessories. Chess pieces are not included with this vintage chess table, so you’ll have to supply your own. 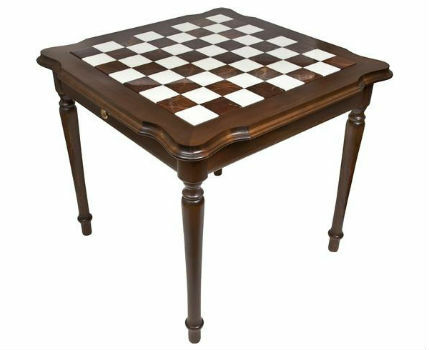 This is a top of the line product with a price-tag that reflects that level of quality, but remember that this is an antique chess table that will last and last, and it may even become an heirloom in your family. The amount of use that you’ll be able to get out of it will far exceed the higher price in a few years’ time. The level of polish on this antique chess table is unmatched by any other antique chess table for sale in this price range. The 23.5” Alabaster Chess Table is made from the highest quality walnut and Italian Mahogany woods that will complement any decor. In fact, not only will it complement the existing decor in any room, it will also elevate the luxury level of any room it’s in. The large alabaster squares inlaid in the playing surface add a cool, smooth look to the table that perfectly offsets the warmth of the wood. Two storage drawers are integrated into the sides of the vintage chess table almost seamlessly, except for the brass handles on each drawer which add to the overall vintage look of the piece. Inside the drawers is plenty of storage space for all your chess pieces and accessories, or anything else you might want to stow away in there. 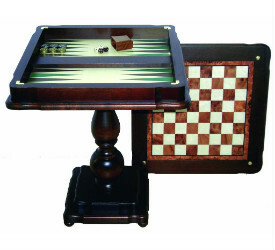 This antique chess table is made from the finest materials in a luxurious vintage style. 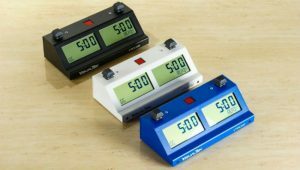 It doesn’t come cheaply, but you get what you pay for, since this is one of the best chess tables on the market today. 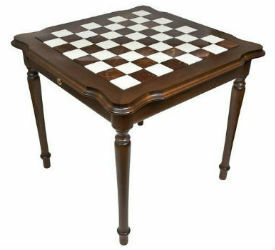 Any collector or chess lover would be happy to have this elegant vintage chess table as a part of his home or office. Each of these antique chess tables has been hand carved by the finest Italian craftsmen before it’s shipped out to your home or office. 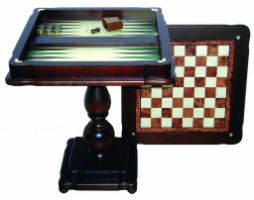 The 23” Ultimate Italian Game Table is truly the ultimate game table because it features playing spaces for chess, checkers, backgammon, cards, and more all packed into one compact vintage chess table. The number of different games you can play on this vintage table really adds to its value, meaning you’re getting a great deal of functionality for a really amazing price. You can also turn it to the blank card playing side to “disguise” it as a normal side table if you need it to blend in with your other furniture at any point. In fact, the rich dark brown color of the Mahogany and Walnut woods that make up this table, along with its antique style mean that no one would ever suspect this table is anything other than a gorgeous but regular table if you didn’t want them to. Imagine their shock when you flip over its top to reveal a chess board! After you’ve played a little prank on your friends, they’ll be wowed by this chess table’s gorgeous antique style and detailing, along with its incredible multifunctionality. You can be sure they’ll want to sit down and play a game or two! 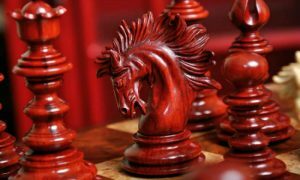 So there you have it- our list of the top most highly recommended antique chess tables available on the 2019 market. We hope that you found something that caught your eye! If not, maybe antique chess tables just aren’t quite your style. If that’s the case, there’s no need to give up on finding your perfect chess table, since they come in all sorts of different sizes, shapes, and styles. 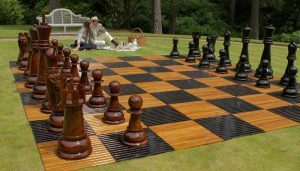 If you haven’t found the chess table of your dreams yet and want to keep looking, check out some of our other articles about chess tables, including our main chess table page and our list of highly recommended wooden chess tables. Maybe you’ll find something you like over there! 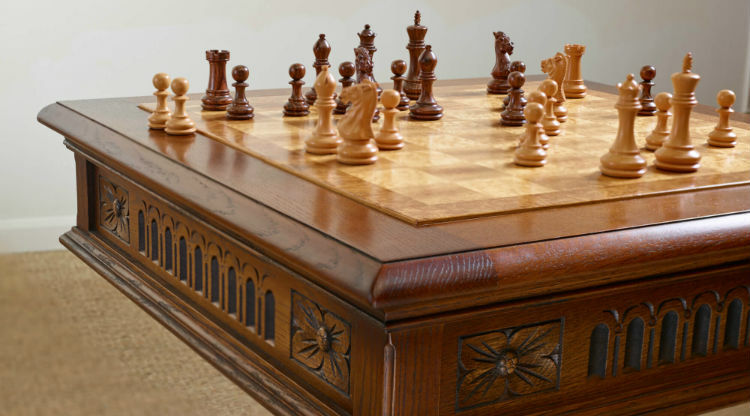 For antique chess table lovers, finding a great chess table doesn’t have to be a time consuming process. You don’t have to search high and low on auction websites, or drive to antique shops all over the country, because we’ve done all the legwork and research for you. This list of antique chess tables contains the best, most luxurious, highest quality products in this category, and you barely had to lift a finger to find them. Now, what are you waiting for? Go get your dream table!